Man’s Invisible Messenger – ACRONYM Inc. The story of the 20th Century is, in many ways, the story of the nerd. In the early 1900s, the train was technological revolution, and steam-powered printing presses saw a proliferation of newspapers and magazines in a way that allowed for quick and direct communication, at a time when prices dropped so low enough for anyone who could read to have access to the very ideas of the entire modern world. As communities slowly formed around these new technologies and forms of communication, the first attempts to connect the planet with phone lines was also underway. Electricity was in the air, and the stage was set for the real nerds to plan the next revolution that would radicalize the country and change culture forever: music & radio. Nerds played a muted role in the world around us in those days. Inventors have been at the core of the world’s evolution, one piece at a time, as Mr. Cash would later say. Academics cloister themselves much like monks, emerging with a new form of math or a new insight in geology, or a different take on roots rock. Explorers forge new paths and return with artifacts, or new albums that will blow our minds. The nerds changed the way our lives were lived, day to day. Once electricity was the plaything of inventors, it was a race to find the things that this new discovery could bring to the world around us. To this end, people gathered in their sheds, their kitchens, their bedrooms, and at their desks, reading about this and experimenting with that. Isolated, alone, immersed in new research & cutting edge technology, the late 19th Century gave rise to the modern nerd in the form of inventors. Before long, these nerds would develop a new form of communication that makes The Magazine seem quaint and old-fashioned: Radio. Electricity, and what could be done with it, was starting to become old news, and even hobbyists were more interested in bigger things. With all the benefit this wired gear was getting us, the ideas of wireless – the properties of electricity in a form that was not contained in wires – still seemed absolutely fantastic. Wireless was an old notion, and had been floated well before light bulbs and telephones, but where it had been fantasy up until the late 1800s, now it was a Sci-Fi concept that absorbed the imaginations of many young inventors as they toiled in their workshops. The stage was set. This is the story of Radio. Of enthusiasts who wanted to shape the future and had visions that many Americans were not yet able to imagine. As we continue our journey through these stories, what stands out to me is the solitude of these pioneers. Much like their modern counterparts, there were those who felt cut off and isolated from the world at large. Having few peers who understood their dreams and passions, these inventors spent endless hours at their desks, imagining the world and future as interpreted through books and magazines. The story of radio is as much technological breakthrough as it is mythology, hype, and marketing, performed by amateurs, hoping to make it big. In this way Radio and Internet have so much in common, and the way they each describe themselves is eerily familiar. Presently, Radio is a quaint innovation, something that seems obvious and old fashioned, a relic of an era that must be buried in some physical book from the ancient past. But the impact Radio had on the world cannot be understated. In the first 20 years of the 20th Century, Wireless Telegraphy went from the stuff of pulp novels to a service that offered incredible communication over great distances. By 1930, Crystal Radio Sets were available to hobbyists in stories across the country. 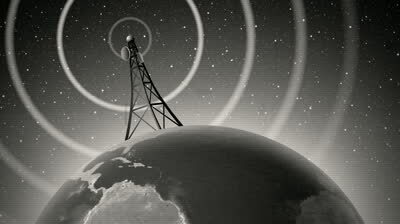 By 1940, regular broadcasts could be heard everywhere, all day, every day. Within the lifetime of my grandmother, she moved from a world devoid of instantaneous communication, to a world completely transformed by fireside chats and baseball games beamed straight into her home, all via a new piece of furniture that looked smart, too. I can only equate it to being exposed to the blinking cursor on the TRS-80 I received for Christmas in 1987. Try to put in mind a paradigm shift of that proportion, and imagine how absolutely radical it must have been for those who understood the implications. I cried when I encountered that cursor, as I hacked out my first piece of BASIC code, trying to let sink in what this new reality afforded me. If Electricity was the rock and roll of our conception of the world, radio was punk rock, spreading ideas far and wide in a dangerous way that electricity could never dream. As important as the story of electricity is, along side it is the story of radio, and both are so entwined with each other that they are essential to each other’s stories. In addition to more excepts from Ken Burns “Empire of The Air” documentary, I also turned to 90 minute recording by Ben Brooks, “The First 50 Years of Radio,” something I found on one of my rabbit hole dives through a link slog. Ben was a radio & TV columnist for the New York Daily News, and Brooks helped assemble this recording to celebrate the November 1970 anniversary of the first broadcast of KDKA, one of the oldest radio stations in the United States. You’ll be hearing more from this documentary as this series progresses. Now, let us get into this week’s history lesson.